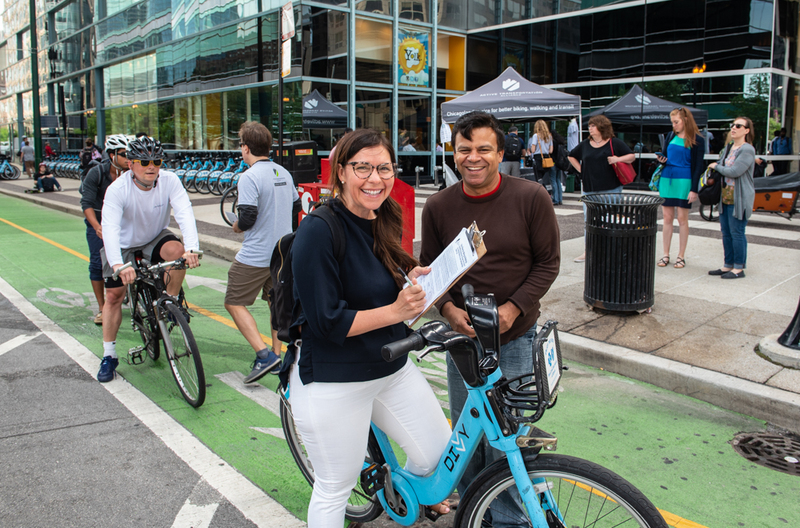 Chicago’s leading candidates for mayor pledge to build at least 100 miles of new on-street bikeways over the next four years, including at least 50 miles of protected bike lanes. All eight candidates who responded to the Active Transportation NOW candidate questionnaire (Daley, Enyia, Fioretti, Ford, Kozlar, Lightfoot, Preckwinkle and Vallas) support building at least 100 miles of new on-street bikeways over the next four years, including at least 50 miles of protected bike lanes. Currently, outside of downtown, only about one-third of Chicagoans live within one-quarter mile of a high-quality, low-stress bikeway. Low-stress bikeways could be a protected bike lane, neighborhood greenway or an urban trail. These types of facilities are proven to encourage more people to use bikes as everyday transportation and calm traffic. They minimize speeding and weaving. Time and time again, these types of biking infrastructure have been shown to lead to less conflict and more harmony. Chicago has installed more than 140 miles of bike lanes since 2011 to create safer conditions. The new bike lanes have contributed to the tremendous growth in cycling while reducing crash rates for everyone — not just cyclists. Still, many more streets need bike lanes. And the vast majority of bike lanes that do exisit in Chicago lack physical separation between people biking and car and truck traffic. Moreover, progress on building protected bike lanes has slowed in recent years. Chicago needs bold leadership to push for more bike lanes that are safe and comfortable to use for people of all ages and abilities. Candidates Bill Daley, Toni Preckwinkle, Amara Enyia and Lori Lightfoot all said that bike lane networks are an important part of Chicago’s transportation network. Whoever is elected the next mayor of Chicago, we will work to hold him or her accountable to the goal of building out the bike network. Our goal is that every Chicagoan lives within a quarter mile of a high quality, low-stress bikeway.